The stage is set tonight at Wembley arena for two former friends now foes in, Alex Lohore vs. Terry Brazier, headlining BAMMA 34 London in a much anticipated clash for Lohore’s world title. Terry Brazier is currently the BAMMA Lonsdale champion, winning his title against Walter Gahadza via first round submission at BAMMA 29; and emerging as one of UK MMA’s most prominent welterweights in recent years, with increasing popularity. Lohore on the other hand, doesn’t seem to enjoy as much popularity on British soil especially for his recent Twitter feud with UFC veteran and British MMA legend, Brad Pickett. However, the impressive French fighter is on a 10 win fight streak with victories over a who’s who of UK and Irish MMA including: Richard Kiely, Nathan Jones, Dan Vinni and Colin Fletcher. We conducted the interview with Terry Brazier after an evening training session in early January 2018 which, was a couple of days before he’d fly out to Phuket, Thailand for his six weeks fight camp in preparations for BAMMA 34 London; and his eventual ‘clash of champions’ with, Alex Lohore. What stood out most from both, witnessing his second MMA training session of the day and afterwards was: Brazier’s enthusiasm, resilient mindset and ambition – traits he has in common with other world champions I’ve interviewed in recent years – such as GLORY Kickboxing’s undisputed heavyweight champion, Rico Verhoeven. Terry Brazier, we were saying how there’s some interesting history at the top of the UK MMA welterweight division at BAMMA. Yourself, Alex Lohore, Nathan Jones; the three of you were good friends once upon a time, even training buddies. But then things took a turn for the worst. Fill us in for especially those who aren’t quite in the know, what was the good history between yourself and Alex? “Me and Alex, we’ve known each other probably going on four or five years. The guys at New Wave Academy, New Wave Academy is a great gym and we know the coaches there. They used to come down on a Saturday, which is our main sparring day, to train with us to get some good rounds in and yeah so that’s how I know them. You were at BAMMA, he joined. You’re good buddies, training together; going on training holidays in Phuket. But why do you say it went south? So out of respect, and friendship and camaraderie, you don’t call him out. He’s there as your guest in-effect. So you call out the most obvious rival at that moment in time, which is Nathan Jones, and you’re alleging that he got jealous because the limelight went on you two and away from him. Upsetting people, burning bridges; if we go back to when he fought Nathan Jones, there was a lot of allegations around homophobia, comments by Alex apparently? Leading up to a fight, there’s a lot of noise around Alex Lohore as we found out when the fight got officially announced. Yeah. Let’s clear this up. When did you receive the contract to fight Alex? Because I know, because BAMMA told me, that he handed in his contract, signed, the night of BAMMA 33 up in Newcastle. So when did you receive your contract and hand it in? Who is quite well rounded with his MMA game and had a lot more experience. Have you got it on good authority he was told he’s got to fight you? Brad Pickett and Linton Vassell have both given their opinions about how Alex initially reacted to the announcement – to touch upon that they reinforced – You’re a champion, you fight whoever you’re told. It sounds to me like, when it comes to mental warfare between the two of you, you’re footing, your trenches are dug quite deep and well connected to get around him and get in his head because you know him so well from the past. The moment an @ekbjj white belt student tapped out a brown belt 😳 I told you, you can't train for me !! When it comes to actual warfare, you know about that from first hand experience. For anyone doesn’t know, can you give a little snap of your military background for us? Yeah that’s something I was saying to you before, what you and I have got in common is dealing with PTSD. When you left a handful of years ago in the army that would have been 2013? Was getting into mixed martial arts is that way of dealing with the emotional turbulence? It’s well reported, everyone’s seen it on the news. We’ve either grown up in the 90’s or revisited. So it wasn’t planned it just happened randomly, getting into mixed martial arts, and a handful of years later yourself and Dean Amasinger are stronger than ever. Better than ever, things are great at MFM. Moved gyms and everything like that as well; and you are a BAMMA champion. And you’ve got a clash of champions come March. But you said you’re going as a team. How has that team shaped up, do you reckon the last couple of years, to coincide with your emergence at the top of the domestic scene? So I’ve got the dream team of coaches. I’ve got to commute for it, don’t get me wrong, it’d be amazing to have them all under one roof. But such is life. It’s like today. I drove up to Spirit Dojo Legacy in Nottingham, trained with Paul Daley, one of Dean’s connections. I’m going out to Thailand on Friday to train with Eric Uresk, Phuket Top Team, another one of Dean’s connections. Yeah to go from Berkshire, Windsor from the M4 all the way to Nottingham then down to Brighton and then into East London, that’s a big, massive triangle Christmas tree in itself. You mentioned the commute there. How do you balance that with family, cause you’ve got kids now as well; and being in-partnership here NFM and anything else you’ve got going? How do you make this all a viable career? Because it’s a dream for everyone. For anyone, whatever age they are, whether it’s something to do with martial arts or in other fields in life and they feel that something’s holding them back, that taking that risk because they’ve got responsibilities, they’ve got a job that’s making ends meet, to pursue that dream, what would you say to them from your experiences? I remember an old interview of yours when you touched upon that. You said how you and your wife send out 100 media packs, and only one person got back to you. Social media, where can everyone find and follow you? Instagram’s your main thing isn’t it? 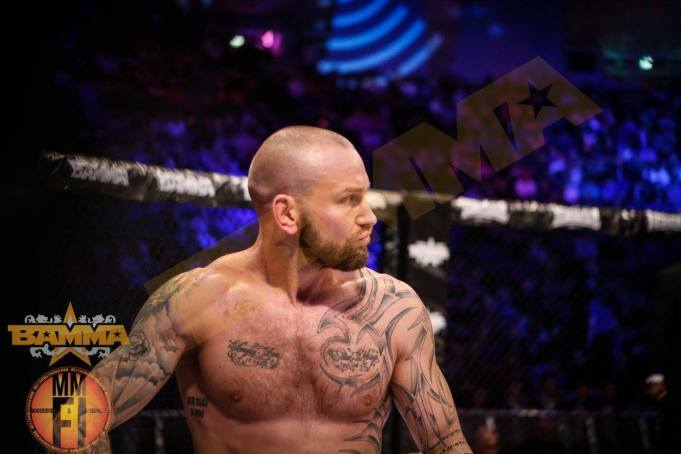 Aaron Chalmers explains calling-out, Kevin “Baby Slice” Ferguson Jr, for a mega fight in 2018, after an emphatic first round TKO win over, Karl Donaldson at BAMMA 33 in Newcastle; and, is “very confident with how quick” he’s “gaining experience in the gym”. The Geordie Shore star now has three wins out of three fights so far on his professional MMA record & believes a potential fight with, ‘Baby Slice’ is viable on a joint Bellator-BAMMA event in 2018. Watch more BAMMA 33 interviews on YouTube. “Like” K1ANOOP on Facebook to keep up-to-date with all the latest World Kickboxing & UK MMA news, interviews. Subscribe on YouTube for much more World Kickboxing & UK MMA coverage too. Arnold Oborotov looks ahead to his next fight with Chris Cooper on June 3, 2017 and an 8-man tournament in Prague (to be officially announced) on July 27. Plus, a couple of other fights later in the year come September and December. As well as his experience of fighting Badr Hari in his early 20s, what he learnt from fighting Badr and the likes of Jérôme Le Banner; and sparring with UK heavyweight boxer, Dereck Chisora. Kaz Mwamba recounts his success earlier this year having won the DUEL Grand Prix, making his debut for Superkombat Fighting Championship and airs his frustrations at what he alleges, wasn’t the right decision on the night at Superkombat. As well as life and work away from kickboxing and training at Bloodline Gym.